Exhibitions are a way to feed the creative soul, whilst often overlooked by consultancies, here at Studio-29 we have found that when we can spark a genuine creative interest in a project, the harder we work. 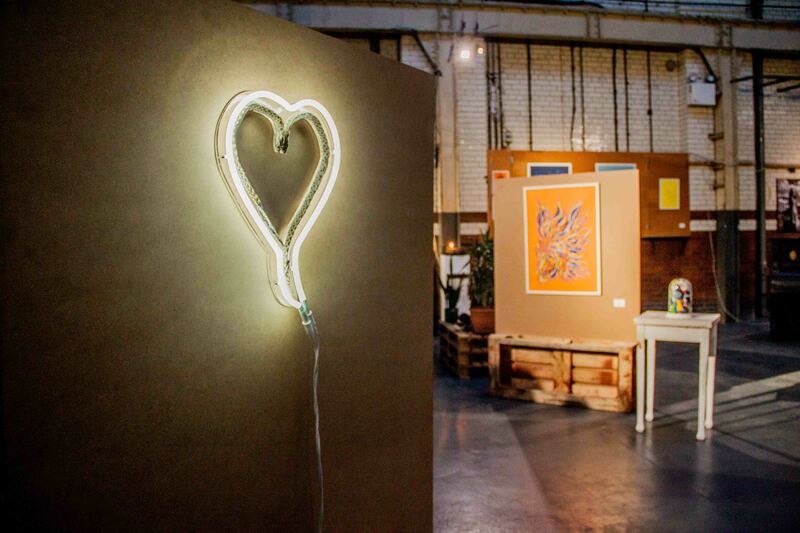 When we were invited to get involved in a ‘secret’ exhibition by property guardians and resident artists at the Brain Yard in Clerkenwell, we knew this is an opportunity too artistically exciting to turn down. Studio-29 were the only outside talent to be asked to collaborate in exchange for lighting the evocative works of art. Taking on a major feat, the team busily commuted between Putney and Clerkenwell for the weeks leading up to the launch in order to organise and commission lighting for the artworks as well as create our own bespoke light art installations. Our feature installation for this exhibition ‘Glittered’ added a third dimension to an existing mural inside the Brain Yard. 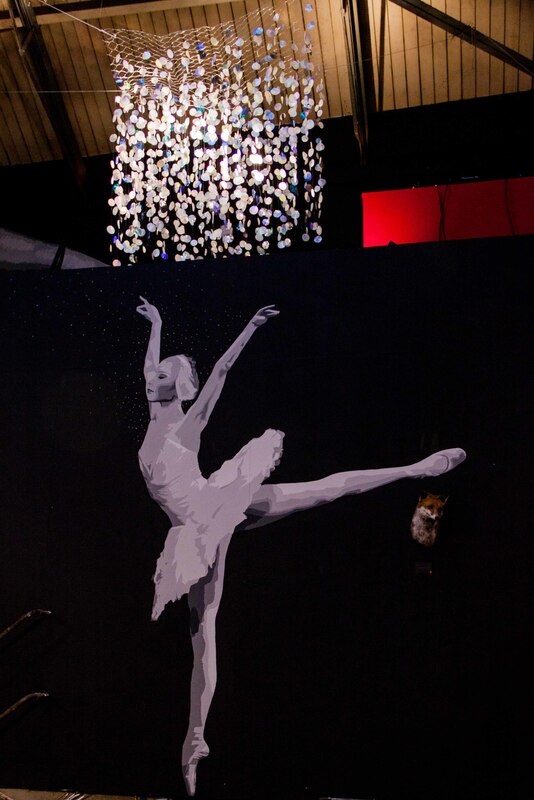 The mural, by artist Atma, shows a hand sprinkling glitter over a ballet dancer. The mural instantly sparked our imagination and creativity – just how would glitter react with light if it was suspended in time mid air? In order to replicate our version of the glitter we chose a representative medium of thousands of sequins using a variety of different colours, degrees of transparency and levels of reflectivity. When catching light, the installation sparkled and created an organic wave-like reflection onto its surroundings. Taking on a ‘down the rabbit hole’ motif of this exhibition, we also hid another ‘secret’ installation hidden inside the warehouse. 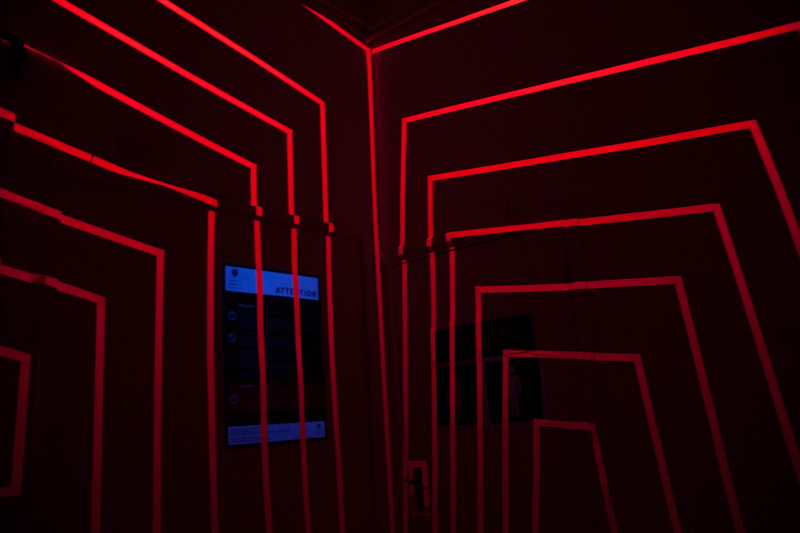 Designed to be unexpected, ‘Lines’ utilises the principle of fluorescence and plays with human perception. 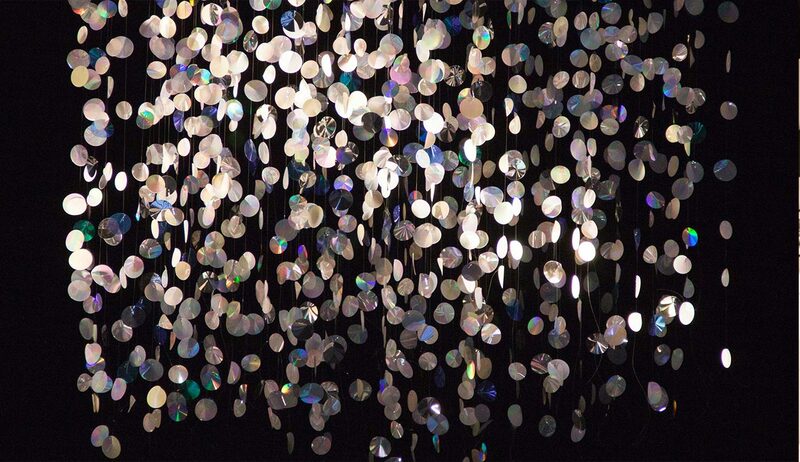 The installation aims to take its visitors by surprise by making the mundane a bit more adventurous. The opening event last Thursday was not only a good occasion for us to let our hair down and enjoy the exhibition over glasses of wine (and tasty falafels! ), but also a good opportunity for us to see immediate reactions toward our light installations. Feedback is so valuable for us as designers and, as in this occasion, make our job very fulfilling when they are positive. So far we think the ‘Work Yard / Brain Yard’ exhibition has definitely created the right vibes. We believe that it is an event like this that keeps the creative spirit of London alive. The private exhibition, ‘Work Yard / Brain Yard’ launched on the northern summer solstice with an opening evening featuring live DJ, Blaine Harrison (Mystery Jets). A brilliant showcase of the resident talent from the Brain Yard’s guardians through varied mediums including; Papercut, Photography, Painting, Taxidermy, Murals and Documentary Film.